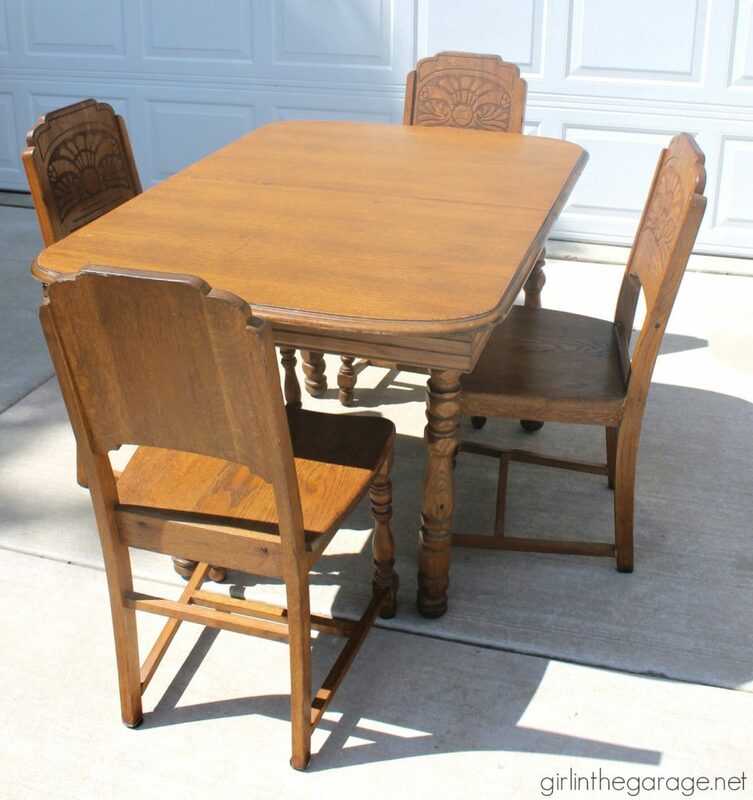 That’s how long it’s been since I loaded up my car with this antique dining set from a yard sale, with the wonky table legs that had been removed and then reattached the wrong way, and then it went to live in my dark storage unit (aka Furniture Purgatory). 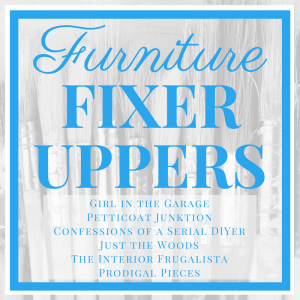 The months and years passed but I couldn’t get over the nerves of doing an entire dining set makeover. And to be honest, staining still intimidates me. 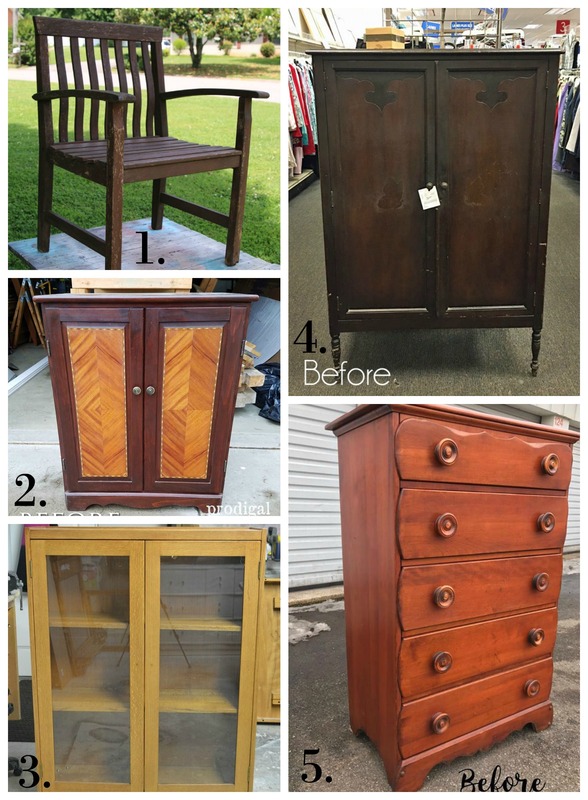 We gave up the storage unit about a month ago which meant a LOT of furniture was coming to our house and we had to get moving on makeovers! 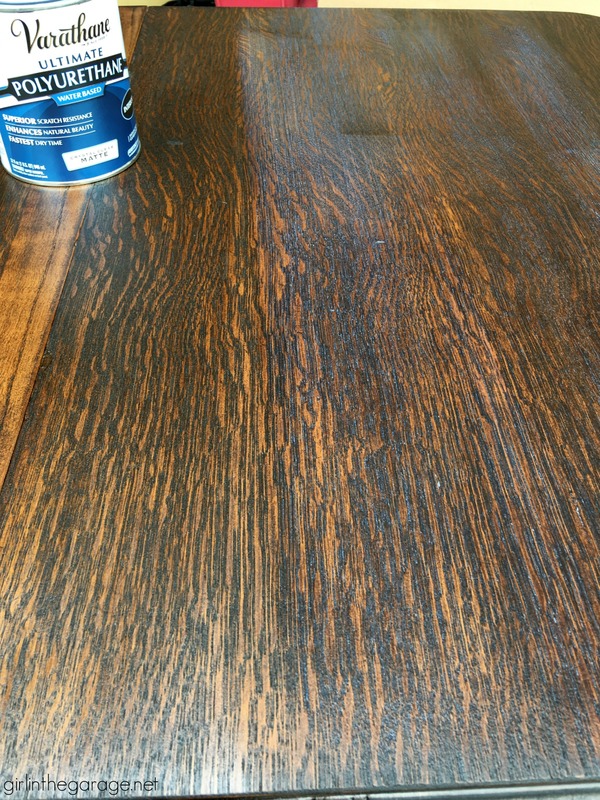 It has such a beautiful wood grain, and the old orangey stain had to go. 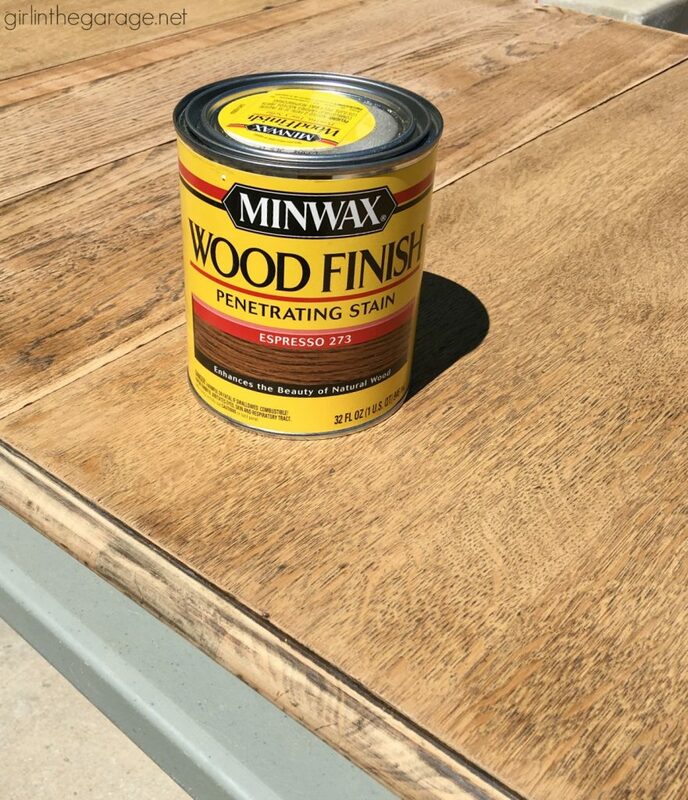 He applied two coats of Minwax’s Wood Finish stain in Espresso for a rich brown top. I call it the Tiger Table – just look at those stripes. Rawr. 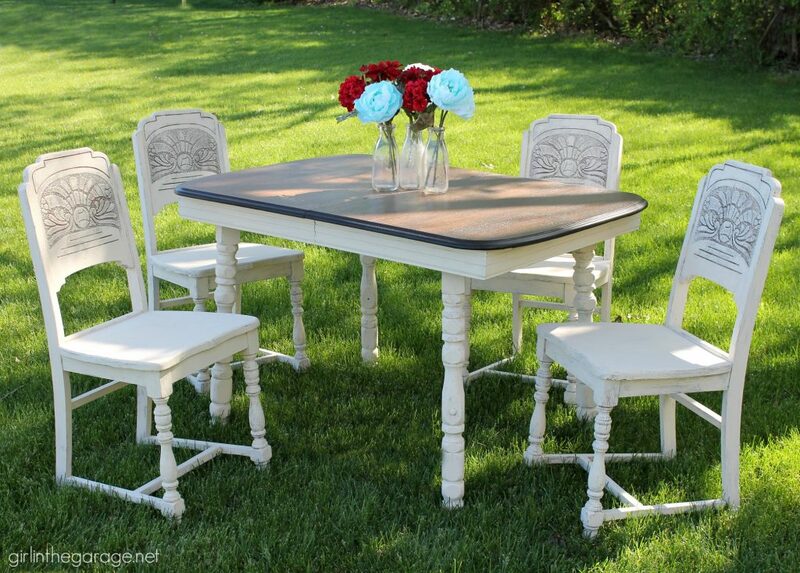 The chairs and bottom of the table were painted in Annie Sloan’s Chalk Paint in Old Ochre. I had about half a can to use and the paint was fairly thick, so it came off the brush in an already-distressed sort of way. I did 2-3 coats as needed and then sanded a little for a smooth finish. It has a farmhouse style vibe, don’t you think? 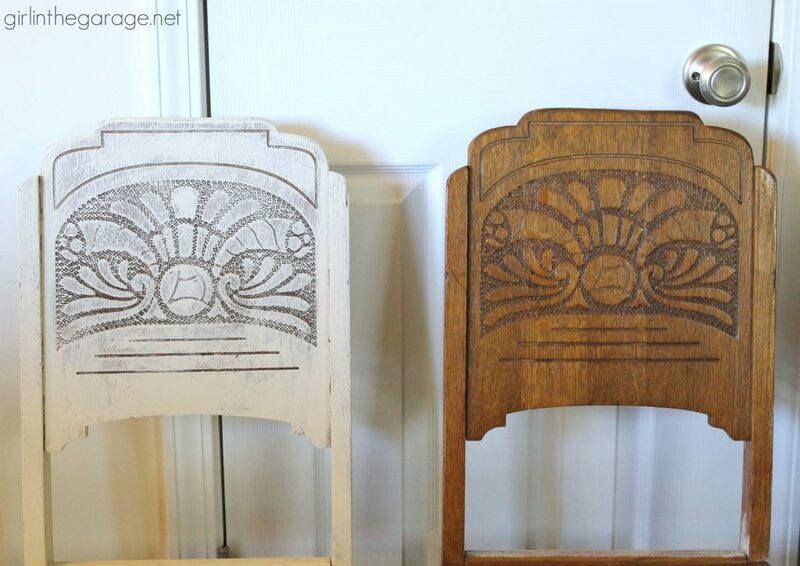 I absolutely adore the carvings on the chairs and haven’t seen anything like them before. The Old Ochre does a great job of highlighting them. It was our goal to finish this for the market and it kind of ending up being the focal piece. This set got lots of attention and compliments but it’s still available for now. We will be taking it to my booth soon. I think it would look gorgeous in a breakfast nook or on an enclosed porch. 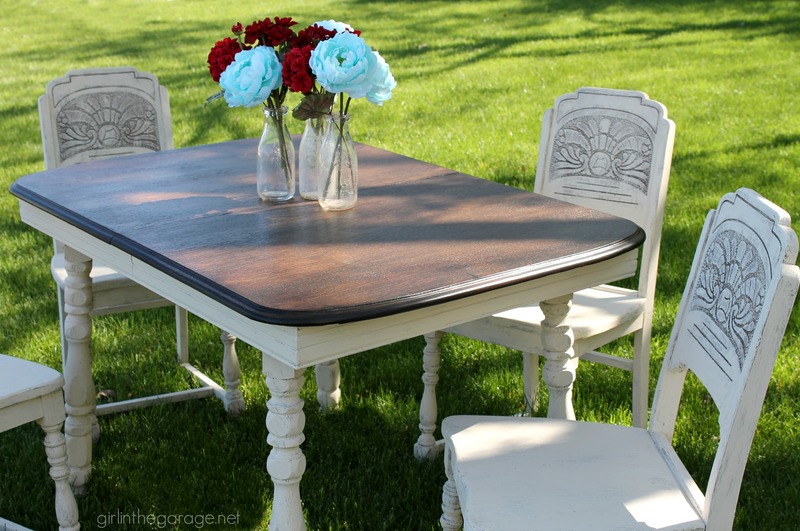 Have you refinished a dining set before- if so what did you think of it? They’re a lot of work but worth it in the end! What type of project have you been putting off for ages? I’d love to hear about it – just leave a comment below. 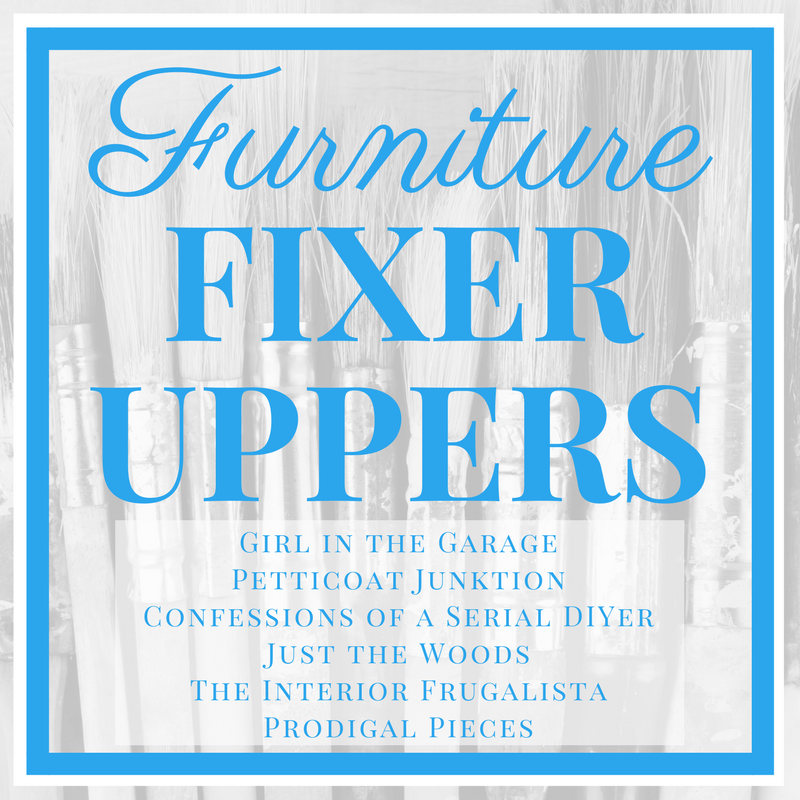 Now it’s time to see five more creative furniture makeovers from my blogging friends! Below are the Before photos – click the links underneath to see the Afters and learn how they did it. 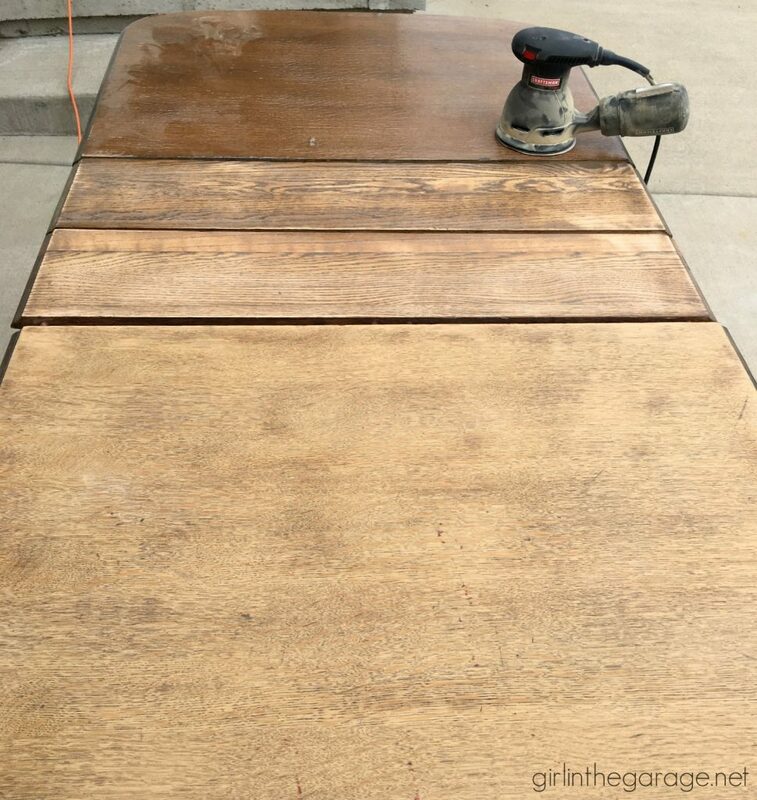 Jen, you made this table go from boring to BAM! Love the refreshed new look. Sharing! The stained top is absolutely gorgeous, but I love grainy oak. The chairs are what are beautiful with the design highlighted. They look stunning. What a marvelous makeover. Thank you for the post. Thanks so much, Sherry – glad you like it! Great job! 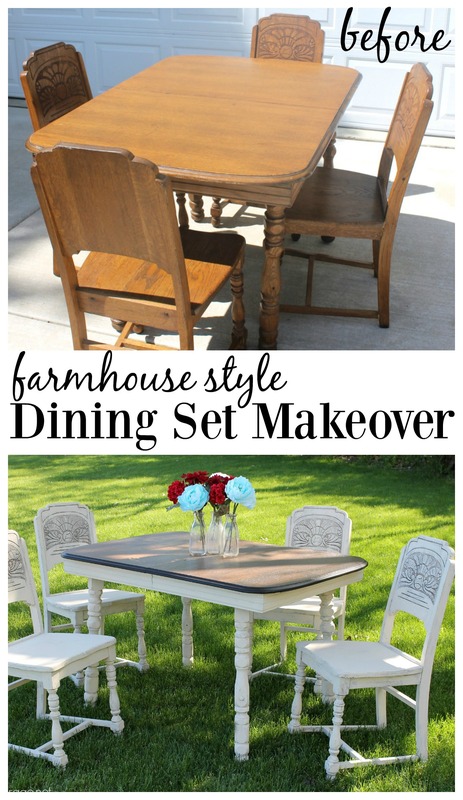 I love re-doing dining sets in that color scheme – dark stained top and light base. I’ve found it to be the most popular combination and it sells quickly. Thanks so much, Lena! I love the look of dark stain and light paint too. I’m just getting used to the stained/painted combo look. That was a lot of work, but it is a treasure now! 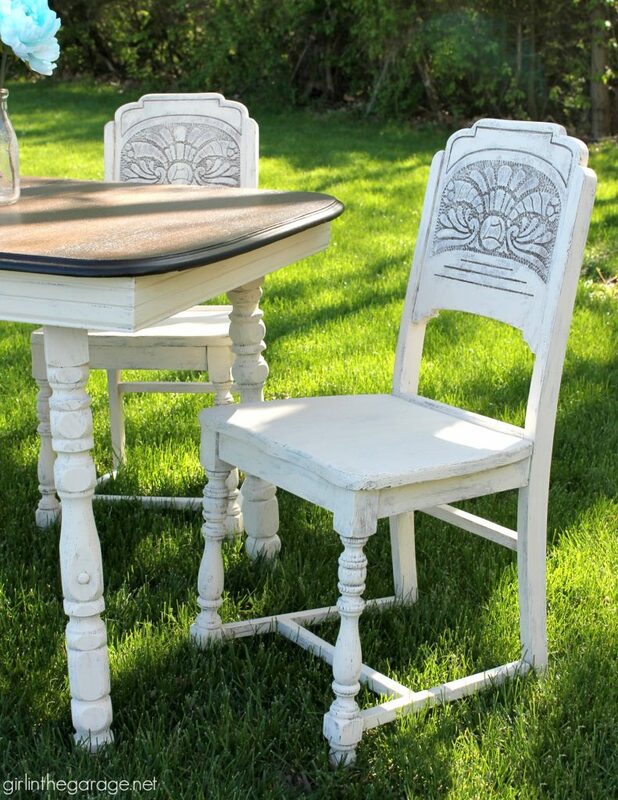 The paint really brings out the details on the chair backs. Thank you Marie. Old Ochre has been one of my favorites! WOW! Reeeeeally nice job on this! I love it! This looks amazing, Jen! The top of that table is gorgeous! Hopefully this will sell quickly for you in your new booth. ? I love it!! I’m so proud of you two! This set now just sings! Lovely!! No wax over the white legs and chairs???? Thank you Lisa! And I’m surprised you’re the only person who asked about that. 🙂 Actually I did use wax at first, but I don’t love using it and I didn’t love how it looked on the chairs. So I painted back over it and then tried something new to me – Fusion Mineral Paint’s Tough Coat which is a wipe-on poly (supposed to be matte and non-yellowing). So far I like it! I’m going to update the post, so thank you for reminding me. Did the Polyurethane Varathane discolor the paint when you used it before? Thank you Justin! I only tried a small test area with the Varathane over white paint before, but it did leave a slight yellow tint and wasn’t quite as matte as I hoped it would be. How I would just love to have that dining set, gorgeous rehab. I was thinking might have been lovely to stain backs of chairs as table top done. The white looks really great, my mind is just wondering how the chair backs would look stained. Something to think about with next dining set. Perhaps stain the seats also. Please forgive my suggestion if out of order. I love the old fashioned chairs like your set has. Perfect! I love them! Wishing I had someplace for them. I love the AFTER! Looks really nice! At the beginning of the post I thought I would hate it but it is gorgeous!!!!!! I just wanted to say thank you for sharing you projects online and how you are able to achieve the finished look. You are very clear and easy to follow on your steps towards working on any of the projects. I tend to doubt myself but after reading your step by step instructions I feel more confident that I too may be able to complete something similar.